Designed by Miguel Mila in 1962. 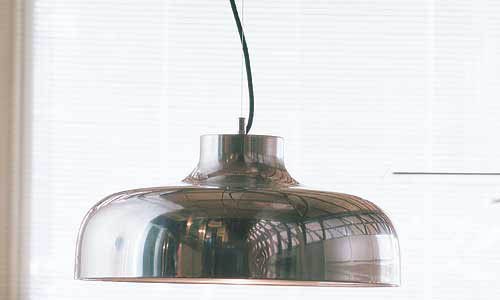 The M68 is a hanging lamp which consists of a large aluminium bell-shaped shade. The electric wire runs from the upper centre section and a tiny metal cylinder marks the transition between the shade and the fine steel wire which supports it. The shade is an aluminium re-edition of the famous Pop lamps of the 1960s. It is a larger-scale evocation of the American Series. The clean-cut quality of the aluminium gives it a certain Nordic air. The bell-shaped section provides a large surface area for diffusion of the light, which makes it the most rational and functional way of lighting a table. Size: 18.11" diameter x 8.66" high. Max. 1 x 100 W.